The other day an old college friend of mine invited me to the Hitchcock Film Festival in a downtown theater I thought had closed years ago. This art-deco building (circa 1927) has been presenting some of Alfred Hitchcock’s most famous films every Friday night for the last two months. The movie we watched was Rope (1948) with James Stewart. It’s already been three weeks since I saw it and I’m still thinking about it. Funny because that same weekend I watched Gravity—an expensive display of special effects that Hitchcock could have only dreamed about—and a story that values life above all (almost the exact opposite of Hitchcock’s film). Yet, the movie that keeps popping into my head is Rope, one of Hitchcock’s lesser-known films and produced over 65 years ago. Perhaps if I explain more, you’ll understand why this film impacted me. 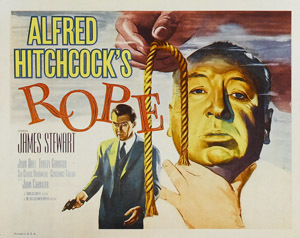 Rope was inspired by a famous murder trial from the 1920s. Two affluent college students decide to kill one of their classmates for the simple thrill of killing. As followers of Nietzsche’s philosophy, they believe themselves to be intellectually superior to other mortals and, therefore, above the moral laws of “ordinary” men. They think they can plan and execute the perfect crime and, to make it more thrilling, they hide the corpse inside a chest of books and invite the victim’s friends and parents to a dinner party. In very Hitchcock fashion, they set the dinner buffet on top of the chest. James Stewart plays the clever schoolmaster who inadvertently instilled this philosophy in the two murderers. Of course, one of the guys is terrified of getting caught, but the other one seems to almost want his former teacher to discover them so he can admire their “masterpiece” crime. The success of the film is in the juxtaposition of tension (anyone could open that chest since the hinge is broken), dark humor (not only in the party set up but also in the dialogue), the motive for the murder (I’ve never heard of something more original) and the Big Question of whether or not the guys will get caught. But this film was fascinating in both content and form. The entire story develops in real time, in one single setting, and the cuts are nearly imperceptible—one continuous scene with very subtle transitions (Hitchcock focuses on a jacket or an ornament to make his cuts seamless.) It’s no surprise that the film was adapted from a play. In addition to this novelty, we have another element that struck me as original: the camera tells its own story. Let me explain without ruining the film for those of you who’d like to watch it. Have you noticed how in children’s picture books sometimes there is the story the text tells you, but there are minor stories that you can only see in the illustrations? (this is where a very talented illustrator can thrive). Well, Hitchcock does something similar twice. While the characters are speaking, the camera is moving around them or is focused on another object, making the conversation inconsequential and the visual action what really matters. This is something I haven’t seen in contemporary film making. When dialogue is present in a film, it always supersedes anything that may be going on in a scene. Because I have a tendency to write complex novels with abundant characters, I always admire writers and directors who can tell simple stories. The plot here is simple: will the guys be successful at hiding their crime? 1. It’s okay to write a story that develops in a short amount of time (and how challenging that is!). 2. People can have the strangest motives for committing a murder (and the more original, the better). 3. Keeping the tension in a story is key. 4. Add humor whenever you can (even if it’s dark). 5. Plot twists and complicated storylines are not always required to write a gripping tale. 6. Build a complex backstory (even if you don’t mention all the details), and the story and characters will seem more realistic and believable. 7. For your ending, keep your audience guessing until the last possible moment. 8. Suppress the desire to make your main characters a) always sympathetic and b) always safe. Let them make mistakes. 1. Life is extremely fragile and can end in an instant. 2. There are a lot of crazy people out there. 3. Never befriend someone who admires Nietzsche! 1. James Stewart was not happy with this role. 2. Hitchcock originally wanted Cary Grant for Stewart’s role, but he declined. 3. The real-life case which inspired this film, Leopold and Loeb, was never discussed or acknowledged by Hitchcock to any of his writers or cast members. 4. The attorney who defended Leopold and Loeb, Clarence Darrow, delivered one of the most famous speeches there is against capital punishment—and saved their lives. Both got sentenced to life in prison (plus 99 years each for kidnaping). 5. According to several online reviewers and the scriptwriter himself, there is a homosexual undertone in the film between the main characters (Leopold and Loeb were allegedly a couple). This may have been the reason why the film didn’t do so well in the box office and why Stewart was not entirely happy with it. 6. This film is said to have been a reaction to WWII and Hitler’s belief in the superiority of one race (man) over another. Are you a Hitchcock fan? Do you think there’s a contemporary director who compares with him? 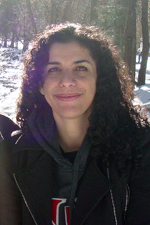 Lorena Hughes was born and raised in Ecuador. At age eighteen, she moved to the US to go to college and earned a degree in Fine Arts and Mass Communication & Journalism. She has worked in advertising, graphic design and illustration, but her biggest passion is storytelling. Her historical novel set in South America, The Black Letter, took first place in the 2011 Southwest Writers International Writing Contest (Historical Fiction category), an Honorable Mention at the 2012 Soul-Making Keats Literary Competition, and was a quarter-finalist for the 2014 Amazon Breakout Novel Award (ABNA). She is represented by Liza Fleissig of the Liza Royce Agency and is a freelance writer for What’s Up Weekly. You can find her on Twitter at twitter.com/SisterLorena. This article was originally published on The Writing Sisterhood blog and is reprinted here by permission of the author.